The Standard Edition contains a complete listing of all Canadian Postal Codes with city and province cross-reference and associated geographic coordinates. 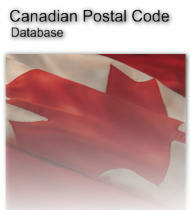 The geographic latitude and longitude coordinates are to the center of the postal code FSA. This product does not provide LDU or street level coordinate granularity. CityType CHAR(1) Specifies whether the city name field specifies the preferred or an alternate name for the Postal Code. Copyright © 2002-2019 Quentin Sager Consulting, Inc.